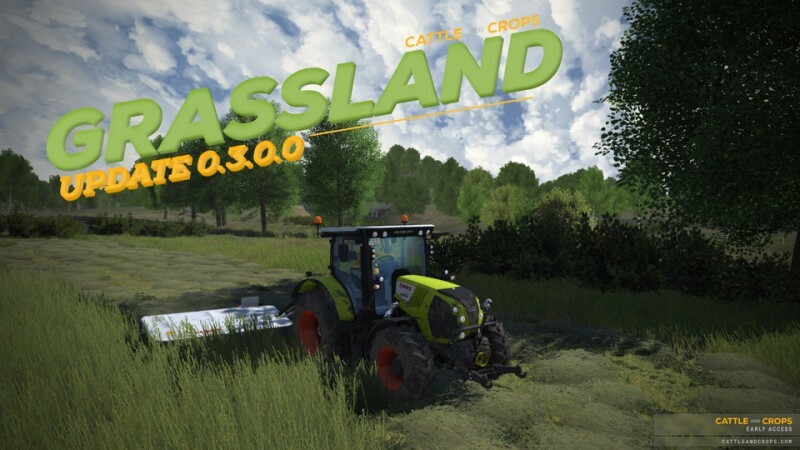 The Grassland Update v0.3.0.0 is now available for download. This update brings the grassland cycle to Cattle and Crops. The weather will affect the swath’s drying process. In dry weather, the wetness in the swath decreases; when raining it increases greatly. The grass needs good weather for it to become hay. During drying the grass will go through different stages depending on it’s wetness, grass (over 70%), silage (70% – 40%) and hay (below 40%). After four hours of rain, the swath reaches 100% wetness and can’t get any more wet. To dry completely, the hay needs about three days without any rain. Windrows are based on realistic volumes and thus will have varying heights. Checking your speed when balind ist now more important so your pickup won’t get clogged up. Wetness and volume will also affect the particle systems’ visuals. You can find the perfect time for cutting and harvesting the grass by checking the calendar in the Planning Menu. Clouds are symbolized as grey, with LC (low cloudiness) and HC (heavy clouds) showing you the cloudiness. To everyone’s surprise, a big yellow dot means sun, while dark grey gives you rain. The forecast is valid for two weeks. One would assume that bringing a tedder and a rake into the game would be easier than the previous machines. Making them behave as realistic as possible, we had to extend the three-point hitch system a lot. Thus, for example, trailing machines like the Volto 80 or Liner 500 are now possible as well. In addition, the three-point hitch won’t push the tractor away from the ground as often as it did before. We have also minimised the lateral forces when pulling a plow. The .pak file format has been replaced with more user-friendly .zips. Additionally, we’ve added a ton of joint options that currently come to fruition in the Claas Volto and Liner machines. Furthermore, we’ve opened up the translation and XML files – so if you’re in the business of adding your local language, you’re in luck. There’s a new story quest in which you can try out the grassland process. The mission is not a requirement and can be skipped. With grassland, in addition to grain and corn, we have reached another milestone on the way towards v1. This is our biggest and most comprehensive update so far, so we decided to split up it into two updates. The bigger part of grassland is included in this update – in the second part we’ll add the loader wagon and the mowing unit for forage harvesters and continue to balance the update. After the second part is out we’ll focus on bug fixing until Christmas. The timeline will be adjusted accordingly. And don’t forget, it’s Steam Autumn Sale! Until November 27th, 7pm CET there is a 50% discount on Cattle and Crops for all supporters (upgrades) and those who want to become one! As always, changes, bug fixes and new features can be found in the changelog. We are looking forward to your feedback! If you like CNC, leave a positive review on Steam! NEW The first upgrades from the Tombstone Engine, the successor of the C4 Engine, are implemented in the update. The new ring detail system optimizes the visibility tests immensely, for example, taking the load off the CPU as well as the video cards. In addition, all distant objects are faded in and out smoothly (with exception of the trees, we’ll have to tackle them in a future update). BUG FIX The dirt texture on newly spawned vehicles is working again. The “Dirt” (dirt 0-1) command can be used via the console again.